Tuesday September 24th 2013 saw a return to a club pool (KW) that I’d not visited since the beginning of April this year. I arrived at 0715, departed at 1630. Fished 2 leger rods on pods with identical set ups – 8lb mainline to 8lb braid hooklength with size 6 hooks – and a selection of baits – meat-based boilies, bread, prawn and luncheon meat. Two good fish lost – first one when I struck, felt the fish for a second and then the line slackened and found out that the braid had snapped just above the hook – the second when I’d removed the lead from one of the rods and cast out a floating bread bait to a spotted fish taking floaters near a floating plant patch, he took but I missed him on the strike and although I don’t think he felt the hook he disappeared from the area afterwards. Fishing in general was hard work! 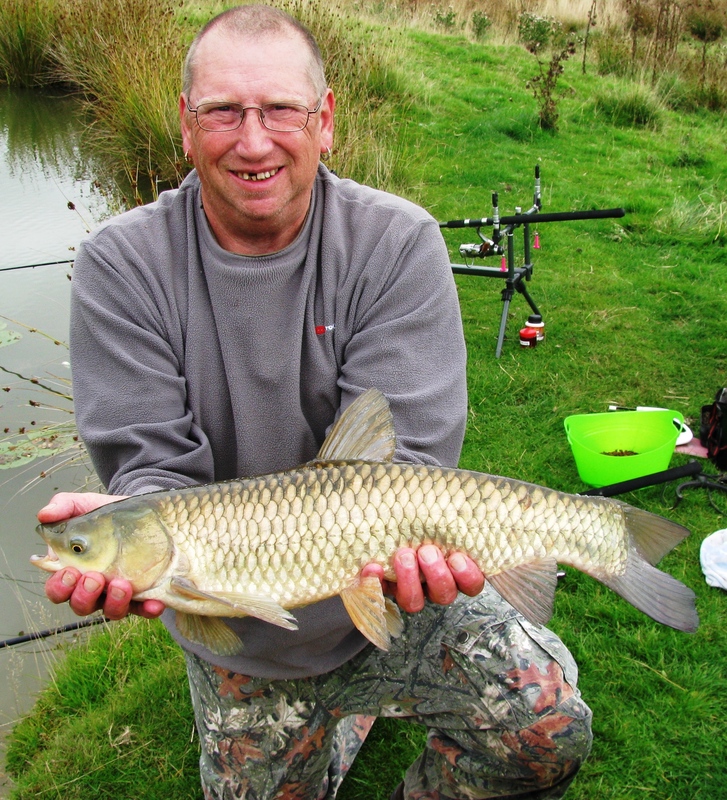 Due to the fine summer we’ve had it seems that spawning was very successful this year as the water seemed to absolutely full of small carp and roach (and from reports from others, tench and other species too). Throw in bread and the water erupted like a piranah attack! But these small fish soon made short work of any bait offered by whittling it down until within 5 minutes there was nothing left on the hook at all – inc boilies. Consequently, the day was full of leaping/twitching bobbins but with little reward – and most rewards were small carp of 2-3oz usually foul hooked around the head/mouth area, The two best fish of the day were a 14oz mirror carp and a roach of about 8oz which was fairly hooked and had taken a bait of luncheon meat that started out at around 1/2″ square by 3/4″ long. So that’s it for this week… as no more fishing this week as I’ll be prepping tackle, etc to take on holiday next week. And the next few blog posts – re: fishing on the hol – will probably be delayed until the week we return home. OK – this is a double header posting combining my two sessions of the last week. The first session was to the usual non-carp pool, the second to another club pool which is the club’s most distant – 35 miles from home in Church Stretton – and thus becomes a ‘day out’ event for Liz and myself with one or possibly two visits each year as its too distant for regular visits. 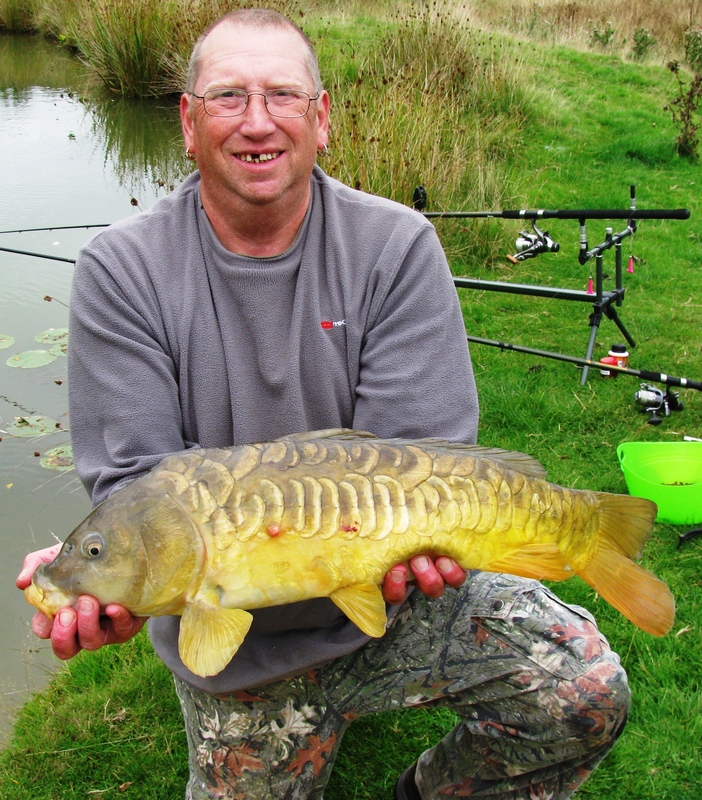 This trip to the non-carp pool was made on Wednesday 18th September 2013 having been originally planned for the previous day but weather conditions led to the change of plans. However, on the day conditions were not too comfortable – cold gusting wind with a couple of small showers – but I was relatively sheltered in that swim from the worst of the wind. I arrived at the pool at 0730 and was tackled up and fishing at 0800. Peg fished was the usual Peg 11 at the end of the island as has been the case on my past few visits. Session ended at 1500. The tackle arrangement was per my usual – one leger rod with 6lb line and size 6 hook baited with prawn fished slightly to the right plus my float rod fished to centre and left with 6lb line and size 16 hook baited with maggot and worm. Both areas were baited up with relevant free offerings. The results of the day were that the leger rod did not get one touch at all fro the entire session but the float rod saw a bit more activity with various bites and a few captures…. 4 chub and 2 perch. No barbel or tench this session. As there has been a distinct cooling in the air temperatures in the last week I have decided that temp recording is the norm again now until next spring…. so……. At this point I inadvertently caught the thermometer’s cable to the remote sensor on the hook and I dragged the thermo into the pool and although air temp seemed to be shown correctly the water temp started showing in the 50’s thereafter!! Abandoned temp readings. And strangely, between about 0915 and 0950 the water temp abruptly (inside 1 minute) dipped down half a degree to 11.7, remained at that for 30+ minutes and then just as abruptly returned to 12.6. Very strange!! No pictures taken on this session. This trip, with Liz, was made on Friday 20th September 2013 to the club’s most distant pools at Church Stretton – there are 2 pools on-site referred to as Upper and Lower – although neither are large and would probably be best described as ‘ponds’ really. When the club holds matches at this place then usually there are 8 pegs on each pool. However, the size of the waters doesn’t mean that the fish are not good sized specimens there. The pool fished on this session was the Lower – which was a first for us having always fished the Upper on previous visits. Also loaded a new thermometer as attempts at drying out the ‘dunked’ one were still in progress and although readings improving they were still way out. Started fishing at around 0900 and finished the session at 1600. To start off the day we both set up two leger rods with 8lb line – one with a size 6 hook and one with size 12. Mine rods weighted with just plain 14g bombs, Liz used swimfeeders loaded with groundbait/maggot/particle mix. Baits used over the day were maggot, bread and luncheon meat. Liz saw first action of the day with a Common Carp followed shortly after by a Mirror Carp and I then joined in the action too…. Over the course of the morning I threw/catapulted out pieces of crust to see if I could elicit some takes to surface baits – and at around 1125 a water disturbance was noted in the margins caused by a fish, taking bread that had drifted down, and which was moving up the pool towards us – so I re-wound in my size 6 hooked line, removed the leger weight and baited up with a piece of crust which I dropped on the margin about 6′ down from my position and this was almost immediately taken and resulted in the landing of a 8lb 8oz Mirror Carp. Following this I also observed surface activity at the far (windward) end of the pool and so I wandered down there with the floating bread set up which elicited the capture of two Grass Carp – a first for this species for me and thus obviously a new Personal Best in the species for me. I took Liz down that end of the pool at that point with a floating bait set up – but believe it or not the flurry of activity around the area had ceased completely and we could not tempt a single take and nor did anything rise to free offerings… and after 15-20 minutes of trying Liz decided to go back to our swims and continue on the leger. 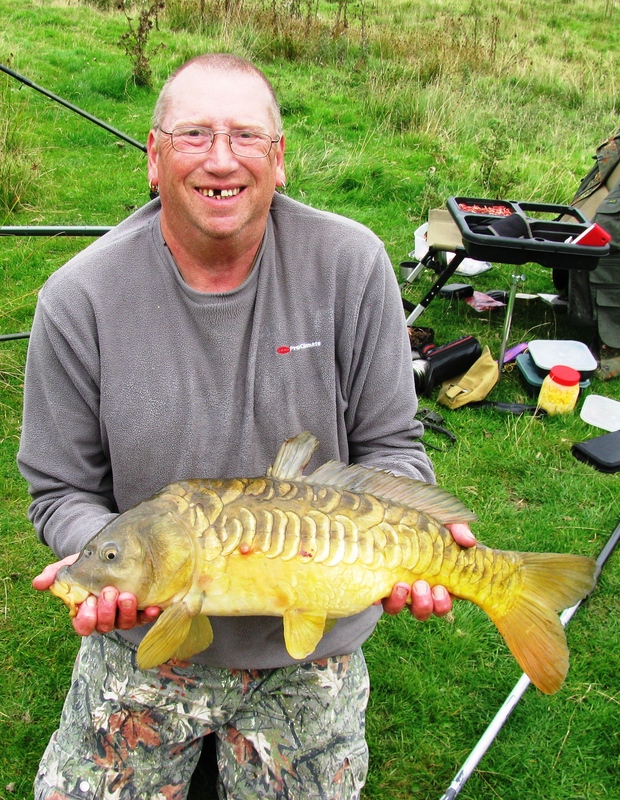 However, at around 1520 I spotted some surface activity on the margin at mid-point of the pool so I again removed my leger from the rod and baited with bread crust I crept up to the area of this activity – and within a minute or two was again connected to a Mirror Carp this time of 9lb 1oz. BUT…. and this is where it gets a little strange as this was the SAME (*) fish as the 8lb 8oz one caught some 4 hours earlier – see photos, same sores on side of body, identical split dorsal fin… no doubts! 🙂 So why had the weight changed? I’d not fed THAT much bait in in the time gap :D. And nowt wrong with the scales either!! Anyway, having landed that fish – and chatted to the farmer who arrived as I was playing that fish – it was time to pack in albeit being about 15 minutes later than intended as Liz wanted to pop into a shop in Bridgnorth before closing time at 1730 – but we made the shop OK with 15 mins to spare as it was – although the shop didn’t have the desired item in stock anyway. Thought: with thoughts of leaving and late packing up plus chatting to farmer maybe I forgot to zero the weigh sling on the scales? 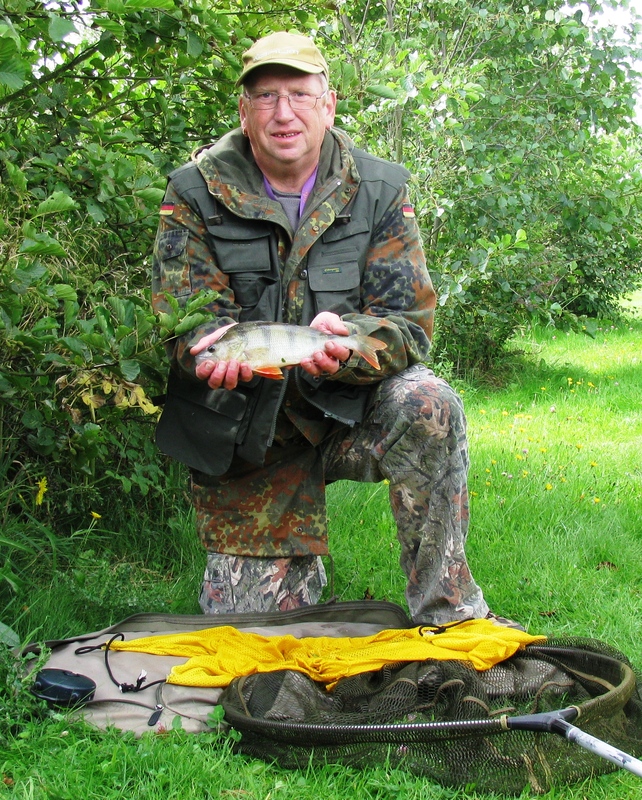 The sling when wet does weigh about 8oz… which is the difference between the two different weights for that fish…. ummmmm? 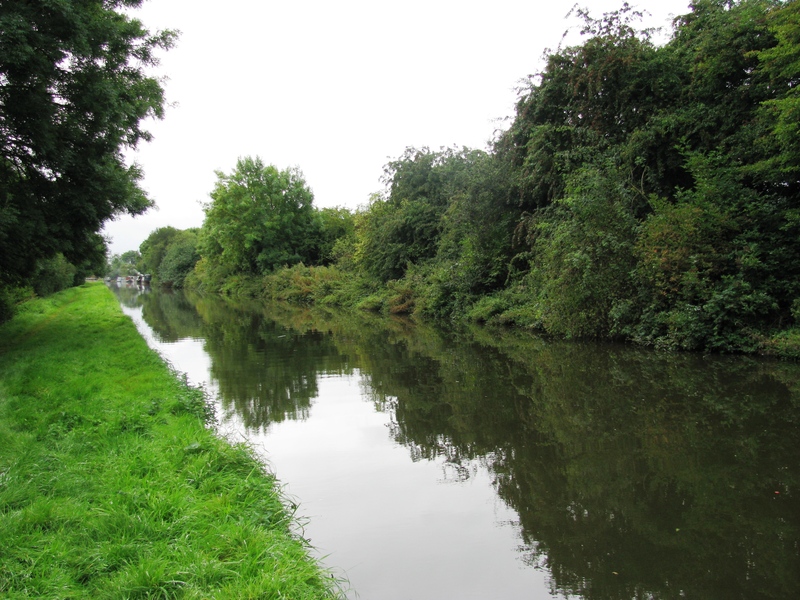 Session 47 – Drop Shotting on the Shropshire Union Canal. 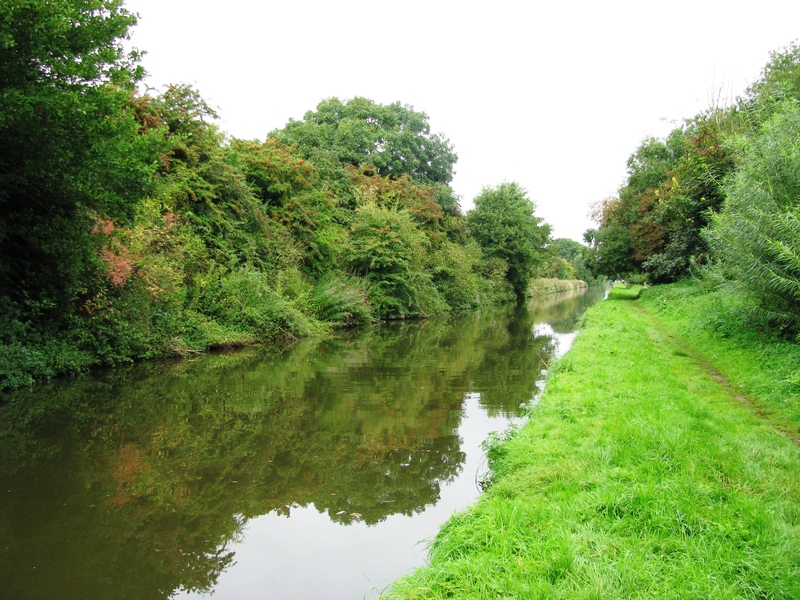 Friday, 13th September 2013 and at 0800 I was on the banks of the Shropshire Union Canal near Wolverhampton. Weather was reasonable – overcast with a threat to rain to start but brightened up nicely over the course of the morning. Water was slightly coloured but not murky. My tackle consisted of a Mitchell 2.42 metre (8ft 6in) spinning rod used with a mainline of 30lb braid to which the dropshot rig of a size 1/0 de-barbed Aberdeen hook fitted with small a small jelly lure and weighted at the bottom, 15″ below the lure, with a 1/2oz bomb. See: http://www.youtube.com/watch?v=MM2n2Ytd070 for UK canal drop shotting info, tackle and techniques. As you will gather from the two cited videos above, my kit is not the ‘proper’ stuff but mish-mashed from from normal gear – but no reason why it shouldn’t works as effectively though if the the technique is correct. Well, in actuallity I’ve just made a short story longer, as the story was shot anyway! DOH!!! My lure to start was a small (ca 3in) pale gold jelly fish not too dissimilar to that that Stewart shows in the second video above – if anything a slightly subdued version of that. Later, after several boats had passed through I switched to a slightly larger jelly with a bright red top body, pale cream underbody and a twin fluttery tail in order to increase its ‘presence’ in the murky muddied waters kicked up by those boats…..
At this time (1100) I was also suffering a bit of back fatigue and aches so I decided to call it a day and changed over to a standard lure setup using a 9.5cm 4Play Soft Savage Gear Fungus Roach jelly in a small lip scull and headed back to the car stopping at the more inviting looking areas for a few casts. But all was in vain and I arrived back at the car at 1200 still without and activity – no pulls, follows, pluck, etc. But the boat traffic was also picking up at this time – at one point 4 boats in convoy passed by with one boat going the other way at the same time… a sort of watery M6, I suppose. Next trip probably will be Monday or Tuesday of next week – possibly to one of the club pools I’ve not visited since at least March or maybe back to the non-carp pool… and later in the week we may to travelling out to Much Wenlock to a couple of the club’s pools over there that Liz said she wanted to return to…. A Page Of Thoughts And Other Meanderings…. 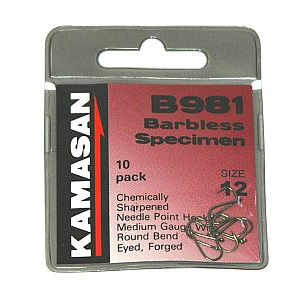 For a long time my hook of preference has been the Kamasan B981 Eyed Barbless. The ideal Eyed Specimen hook for a wide range of baits, and based on the B980 barbed hook, it is produced from a medium gauge of carbon wire and has been heavily forged to strengthen the bend. However, recently, I have found that many, admittedly with both fish and hooks of the smaller end of their scales, fish were being lost by either ‘bouncing’ off (ie flapping and rolling on the surface) or coming adrift whilst trying to lessen the pressure applied to the fish to try to alleviate the ‘bouncing problem. The problem lessens with size of the fish (generally 1lb+ are no problem) and increased size of hook (size 6 has no problems). It seems that with larger fish, there being more bulk to apply pressure against, then the hook is held more tightly to the bend. Anyway, although I don’t really mind losing small fish per se (I’d much rather catch one 10lb carp than have a bag of 200lb of 8oz roach, for instance) it provided a ‘problem’ which was there to be solved (or to be at least improved upon). To this end, I studied the various eyed barbless hooks available and decided that the Kamasan ‘Animal’ range would be worth a try in its eyed barbless genre. These hooks feature an in-turned curved beak point and medium length shank. 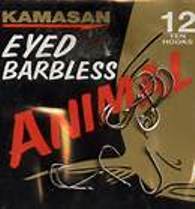 Kamasan Animal Eyed hooks are the ideal big fish and bagging up hook for Carp, Barbel, Tench, Chub etc. The curved beak point greatly reduces the chances of gaping and provides a most secure super strong hook hold. BTW – Our club waters are subject to a barbless hook only rule but even if that were not the case then I prefer the use of barbless anyway using only barbed hooks when pike fishing with treble hooks and even then only one point is barbed – the one, or one of the one’s, that are the bait holding points – with the barbs on the other points flattened down with pliers. I use eyed hooks in preference to spade end as I believe that,however well the spade end is made, at some point it will cut/fray the line around the knot due to chaffing. Also I do not use ‘knotless knots’ on any hook to create hair rigs either for the same reason and more so due to the bare end of the wrap that creates the hook’s eye. Anyway, I’ve now obtained some of these ‘Animal’ hooks in the sizes 12, 14, 16 and 18 and have used a size 16 on my latest trip out replacing the usual size 16 B981. I must say that I did, on this admittedly limited usage period, detect an improvement in connecting with and retaining fish to the landing net and I should say that there was at least a 50% improvement on this session from any previous session when I used B981 regarding the number of fish (mainly perch which are well noted for having bony mouths which do take hookholds easily). I did still lose a few fish enroute to the net/landing but far fewer and in general, as I recall, when using a bait that may have been a bit big for the hook and thus ‘shielding’ the point on the strike. Early days yet to come to a real conclusion but this single session does seem to show some promise. 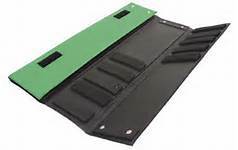 My hook wallet is one of these type – about 24″ long – which allows hooklengths to be stored straight and stretched thus alleviating the curls that occur when hooklegths are stored wrapped around formers or in coils in plastic packets. The loop on the end of the link is placed behind a peg at the end of the wallet and then the length tensioned using the natural elasticity that exists in nylon, even the pre-stretched versions still have a little, and the hook is placed into one of the foam strips that are fixed across the boards. So, then the elasticity of the line keeps the length tensioned and held in postion. BTW the wallet can hold in excess of 80 made up lengths when full. Anyway, all of which is great…. if you use nylon hook lengths…. but not so good if you use braid, as I do for all my hook lengths for the suppleness it provides. I believe that the stiffness of even 2lb monofilament is more of deterrent to a fish taking a bait than the ‘invisibility’ factor of it being a ‘plus’ ie cons far outweight pros in this case. That being the case I use hooklengths of braid of 8lb or 12lb BS depending on the BS of the mainline and the fish being targetted. Anyway, 100% braid hooklengths exhibit zero stretch – and thus one cannot tension the hooklength to fit tightly between hook in foam and the loop on peg and so at best the lengths sort of float around, at worst the loops come off the pegs and tangles can occur. 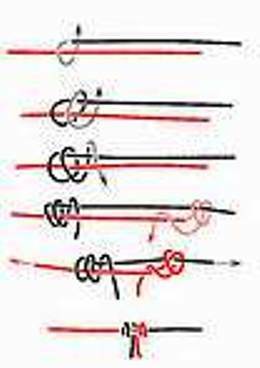 Also, long braid hooklengths are easily tangled when in use due to their suppleness – and although with a bit of patience they can usually be unravelled its fishing we’re supposed to be spending time at – not unwrapping line loops…. Ok, so I’d solved the problems and just needed to connect the hook-tied braid to the looped piece of nylon. And now the fun starts… what is the traditional knots for joining lines? Loops are made in both pieces of line at the points they are to connect together, then one loop is passed through the other, and folded back and the loose end of that piece is passed through its own tied loop and pulled down until the two tied loops lock together in a sort of figure ‘8’. Works but not a tidy solution to me…. The 2 loose ends of the lines (A & B) are laid alongside each other in opposing directions. A is then wrapped (usually 3 times) around B and its loose end brought back down and passed in the gap between A & B below the wraps and held in position there whilst B is now wound around A in the opposite direction that A wound around B (eg A-B clockwise, then B-A anti-clockwise) for the same number of turns and then the loose end passed through the loop between A and B through which A passes but in the opposite direction (although the diagram shows differently it is incorrect!). The lnes are then pulled away from each other causing the wraps to close up on each other and tighten trapping the loose ends and making a secure join. OK! !… now try that in a draught free room under perfect lighting… easy??? NO!! And then imagine a dull day at a windy waterside…. Not for the faint-hearted or the easily defeated!! If you can tie a eyed hook with a 5-turn half blood knot, then you’re sorted. Especially if you can do it with your eyes shut as I can. Basically, it’s just a matter of tying 2 3-turn half-blood knots… Take your two lengths of line (A & B) and fold the end of line A that is to be the connection end into a loop held between forefinger and thumb… now think of that as the eye of an hook and tie a 3-turn half-blood knot around it with line B…. 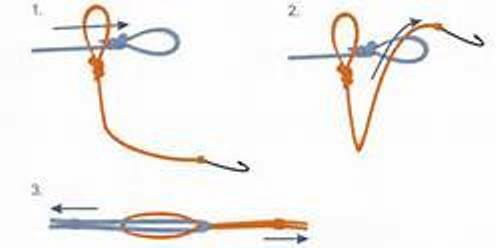 now using line B create a loop in that higher up than the line A knot and using the loose end of line A tie another 3-turn half-blood knot on the loop in line B. 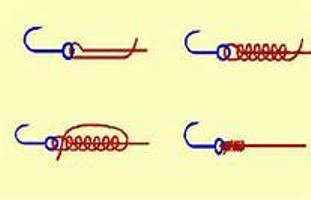 What you should end up with is something like the 3rd or 4th diagram of the blood knot above but instead of just two loose wrap and tucks you’ve two fully independent knots in their own right… and the only thing to do now is to pull and the main lengths of A & B to pull the knots down onto each other (lubricate the knots with a bit of spit – or Perrier water if you’re posh – before sliding to prevent heat damage due to friction. Dead easy to do in the living room – and just as easy on the river bank, in a howling gale and whilst it’s lashing it down. For reference of what a half-blood knot is…. this diagram shows a 6-turn half blood knot, count the wraps :). In my knot the loops made in the line take the place of the hook’s eye. 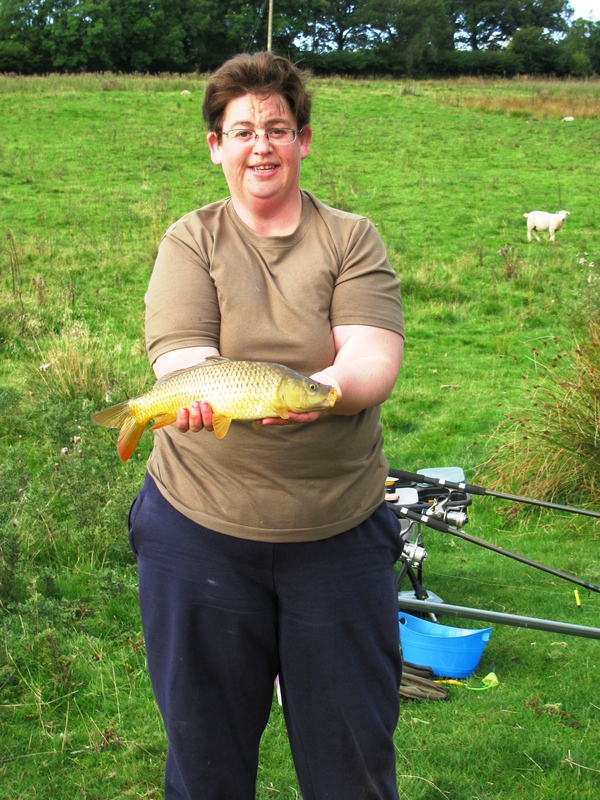 Session 46 – Back to Tench, Perch, Chub and Barbel…. Tuesday 10th September 2013 and I’m back at the club’s non-carp pool – really should call it that as, as I’ve said before, it’s not solely tench stocked but has most species bar common carp – or even use it’s proper name which is Barlow’s. Whatever…. Anyway, I arrived there, after dropping Liz off at work, at around 0730 and headed to peg 11 – which is the peg I fished on the last visit – just opposite the end of an island – fuller details see last posting I made for this venue. At the time I was the only one there but it seemed a couple of others fished too lower down the pool later in the day. I fished then through to 1800. I used two rods – (a) my standard laying-on setup – float rod with size 16 Kamason ‘Animal’ barbless hook, 8lb braid hooklength, 6lb mainline, and overshotted antenna float fished about 4″-6″ overdepth and (b) a leger rod with 6lb mainline, 8lb braid hooklength and size 6 hook fished on a bite alarm set up. On arrival I fed the intended float line – front and to left – with dead maggots and topped up this throughout the day on little and often approach, and to the right of the swim with prawns in the leger rod swim. The float rod was much much busier. Bait was maggot and worm, singly or as a cocktail. At the start of the day most bites were coming from directly in front of me in the clear water but later in the day the ‘hotspot’ shifted to the edges of a patch of lilypads to my left. 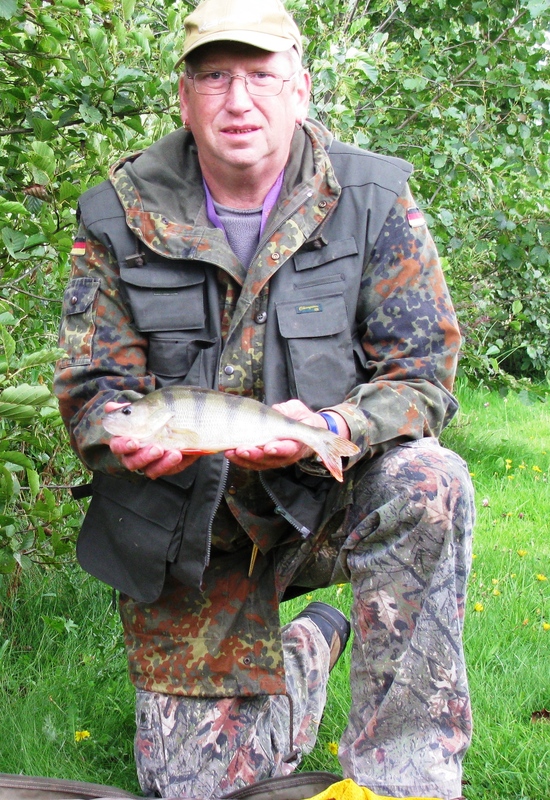 Perch: approx 22, mostly 2oz to 8oz but a nice 1lb one too. 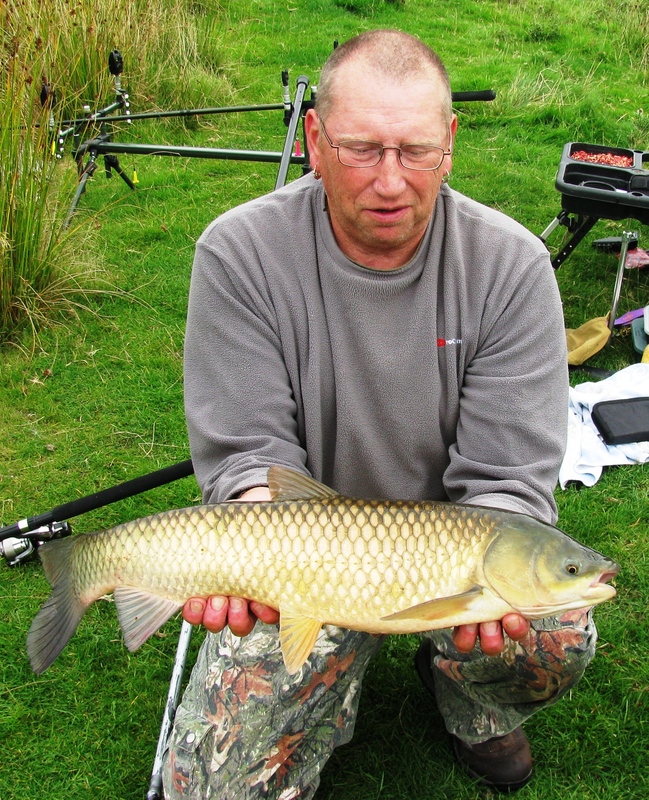 Session 45 – The Barbel Search Continued…. Wednesday 4th September 2013 saw Liz and myself heading out to the banks of the Severn at Blackstone, near Bewdley, on the BAA administered stretch there. Arrived around 0815, fished until 1530. River was low and crystal clear – and results reflected on our basis for the selection of the swim we fished – ie a swim that we could both fish from, which was probably in the worst spot for actually catching anything being in the probably the shallowist section of the stretch. But I did think that we may get some perch or chub if not barbel. Anyway, we fished the first half the day with legered meat and the latter half on maggot with swimfeeder. 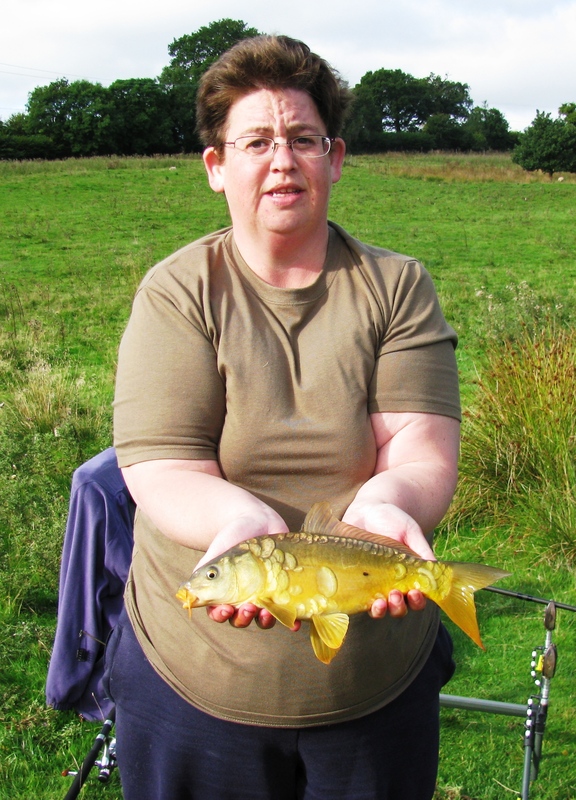 Results on both methods not exceptional with no fish caught, and only the odd tweak of the bait and that mainly on Liz’s rod. A nice day weatherwise, saw a heron, a couple of kingfishers and a cheeky robin that occasionally sat on my rod and also tucked into my maggots in the box from time to time. So basically, that was the day! Not a lot to report … and the few photos I took of the robin came out blurred too…. AND … I had intended to go fishing today back on the tench pool but I was very tired this morning and slept in, a decision probably also influenced by the not-so-good weather. I’ll probably head out on Monday now … really want to go to the pool but also want to go dropshotting on the canal too so which will win I don’t know at the moment. (**) I’ve not used these types of leger stops for a long time – like using split shot I find that they cause too much line damage by severely flattening the line. My choice these days are for the Enterprise Tackle Adjuster Stops (http://enterprisetackle.co.uk/et04-adjuster-stop) which are far far better in my view. In the event of shortage I use a similar setup using a small swivel, a short piece of silicon tube to tightly cover the swivel and a small bead (bead on line, line passed through top eye of swivel then bottom, then back to top and down to bottom, push silicon over swivel. Easy to move on line BUT rubber covers must be removed before doing so ideally to prevent damage due to heat from friction. 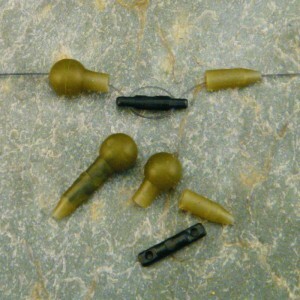 It also depends on the weight of the leger and the force needed when casting as if you need the double wrap around the central pin (swivel) – quite often for short and/or easy casting then a single pass through top and bottom is fine allowing (a) in the event of breakage whilst paying a fish, the line to pull out easier from the stop and (b) the line to pull through easier on the strike if the lead’s movement is impeded in any way thus cushioning the force and preventing instant breakage. We actually discovered that the Blackstone stretch is longer than we thought – instead of just the one meadow there is actually a second one beyond it. And there were some nice looking swims in that extra length too :). Deeper and more promising in the current prevailing conditions.